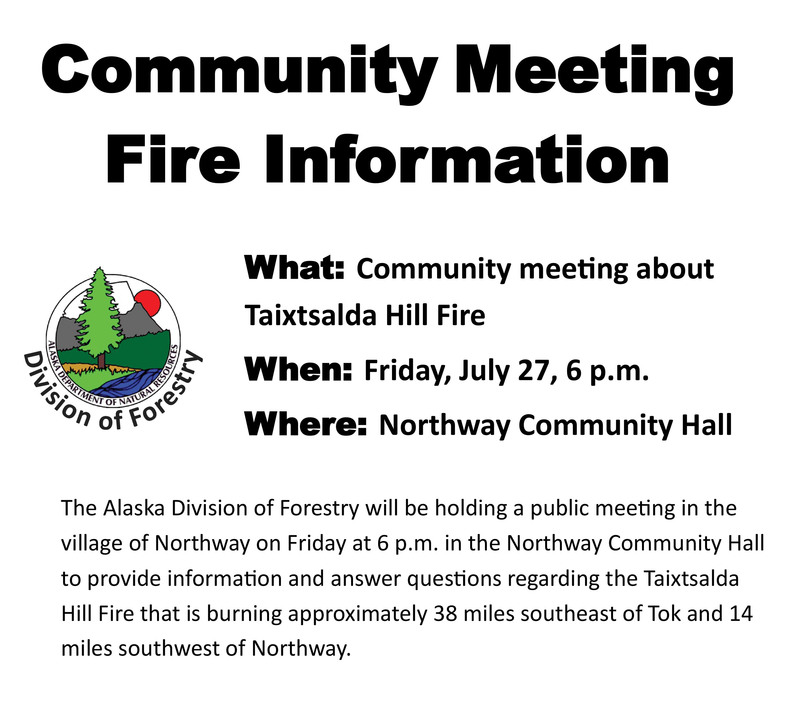 The Alaska Division of Forestry will be holding a public meeting in the village of Northway on Friday at 6 p.m. in the Northway Community Hall to provide information and answer questions regarding the Taixtsalda Hill Fire (#357). The Taixtsalda Hill Fire started on Monday and had burned an estimated 12,000 acres as of Thursday morning. The fire is approximately 38 miles southeast of Tok and 14 miles southwest of Northway. There are currently 89 personnel working on the fire, including four Type 2 hand crews. Fire managers were initially trying to contain and suppress the fire but have since switched to a point protection strategy because the fire has grown too big and fire behavior has intensified to the point where direct suppression tactics are unsafe. Firefighters are now focusing efforts on protecting Native allotments and cabins that may be threatened by the fire. The fire is burning in a full protection management area on Tetlin Village Corporation lands with black spruce being the primary fuel source. Fire managers are continuing to assess what values are threatened by the fire and are developing a plan to protect them. For more information about the fire call (907) 707-9866.